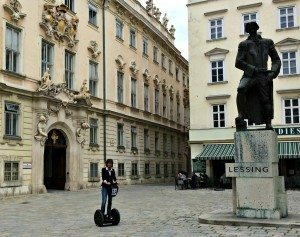 Vienna Segway Tour Review. 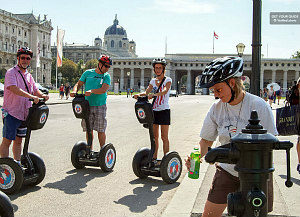 If you have never used a segway, criss-crossing Vienna that way sounds exotic. But I found it was the ultimate treat for my legs, and big fun! Vienna Segway Tour Review. Before we headed off I refreshed my skills on a quiet stretch of Ringstrasse’s bike path. My tutor steered me by boldly walking in front! The plan was to use circular Ringstrasse as our ‘velodrome’ from where we would break off into the city centre. To begin with we broke a rule straight away by entering Stadtpark since it was just the two of us. 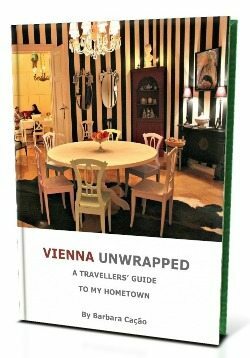 Wheeling towards the golden statue of Vienna waltz king Johann Strauss felt exhilarating. With a larger group we would still have seen it though not that close. Vienna Segway Tour Review. Back on Ringstrasse, we passed five grand hotels and the Vienna Opera House before stopping at the Imperial Vault (‘Kaisergruft’), the last home of some 150 Habsburg Emperors. Even long after the Empire had gone, the last Habsburg, Otto, had a bombastic last funeral there in 2011. Once we approached Graben boulevard St. Stephen’s Cathedral (Stephansdom) unfolded right in front of us. While I remembered my school trigonometry exercises involving the cathedral my guide pointed at the golden globe on top of the church tower… do ask your guide what is in that globe, you will be surprised. At Michaelerplatz, the Roman murals and Spanish Riding School triggered great stories about Wien’s amazing history. 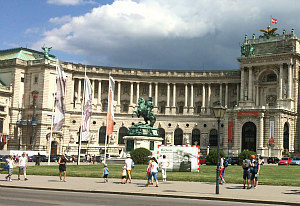 Then we cut right through to the interior of the Imperial Palace Vienna (Hofburg). Actually, rolling on our segways into a courtyard used to horse cloppings felt peculiar. Likewise, segwaying through Heldentor (‘Heroes Gate’) that foot soldiers, Emperors on horseback, and fiakers had used felt weird and wonderful. Vienna Segway Tour Review. Back on the bike path of that flat shady boulevard we explored its most exciting patch: Austrian Parliament, Volksgarten, Burgtheater, and the Vienna City Hall are close together. Instead of stepping up and down for a talk or a photo shoot we remained on our segways and just slowed down. Vienna Segway Tour Review. With equal grace we handled the old remaining city walls at Mölkerbastei, Beethoven’s Pasqualati Haus and Freyung Square. Likewise, baroque Kinski Palace with its beautifully decorated foyer was another sensitive spot for two-wheelers that we managed with discretion. 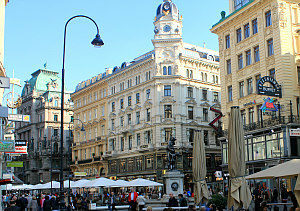 Actually, the most bumpy – though short – ride lead from Freyung Square to Am Hof. From there, we chose quiet Drahtgasse to slip into Judenplatz, center of the Medieval Jewish Ghetto, and one of my favourite places. The hidden square houses the sumptuous baroque Böhmische Hofkanzlei (now housing the Administrative Court) and the modern building block of the Jewish Holocaust Memorial. The monument of Ephraim Lessing received a few laps of honour. 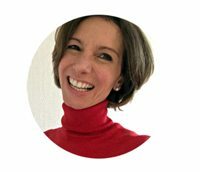 Vienna Segway Tour Review. Whereas seeing top attractions was key the off-stage bits proved the most charming. That became obvious as soon as we rolled through Bäckerstrasse. At Jesuitenkirche we descended in front of the oleander tree-lined baroque gem of that church. A practical word on local traffic signage: In the thicket of this area’s alleys it was often really unclear. In any case, super romantic Schönlaterngasse and adjacent Heiligenkreuzerhof were luckily open to bikers and segwayers: this corner of Vienna is so rich in legends and folkloric stories! Finally, we re-surfaced at the remains of the old city wall at Dr. Karl Lueger Square. For a round up of our tour that cast iron model of old Vienna next to the wall proved perfect. From there we closed the loop going back to the segway rental shop. 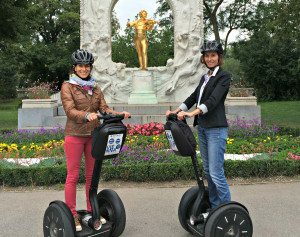 Vienna Segway Tour Review. Most of the narrow streets in the city center are even. Only occasionally, the cobblestones of certain streets shook us gently up. Surprisingly, the many horse carriages and taxis were less disturbing than I thought. Also, I discovered that talking and pointing out things is easier on a segway than on a bike. Click to find out about tour dates and prices.